Practical Marketing Tips, News & Advice. When a customer service interaction goes wrong, you can lose a customer. Here’s how to avoid that. I recently had one of the worst customer service experiences of my life. I spent a few hundred dollars on tickets to a video game convention as a gift for my nephew. However, the tickets were marked “special delivery.” When I followed up, I was told that I would be given instructions on the day of the event as to how to get the tickets—which could range from downloading an e-mail (the venue requires physical badges) to meeting a reseller in a nearby parking lot. Needless to say, if this wasn’t an interaction with a large vendor, I’d feel like I’d been scammed. Poor customer service ultimately left me unclear about how to claim my nephew’s tickets and vowing to never work with the service again. Let’s take a closer look at what went wrong—and how the whole debacle could have been avoided. Assess the problem: In this instance, there was a strange caveat to the product I purchased that I didn’t note or understand. Personally, I never would have bought the tickets if I knew it meant meeting someone in a sketchy parking lot! The information was there, but it was buried and not readily disclosed. Even as customer service noted this, there was no action to take. As a customer service organization, focus on your customer’s experience, and when something occurs that’s out of line with your company’s values, take steps to fix it. Perhaps that individual customer’s situation won’t be resolved, but interactions like this should encourage you to evaluate your policies for the future. Find a resolution: It quickly became clear that refunding the transaction or exchanging it for tickets that would be mailed wasn’t going to happen. Fundamentally, I just wanted to know where and when I could get the tickets so I could plan ahead. Complete resolution wouldn’t be possible; but if an agent had taken a few minutes to contact the seller or look into the problem further to get the information I needed, we could have achieved a state of balance. Correlate outreach and urgency: By the time I gave up on the process, the customer service department and I had exchanged 28 e-mails. In each e-mail, a different customer service agent repeated the same general information. There was no real insight, no additional information, and as a customer, it essentially felt like I’d hit a brick wall. A customer who exchanges 28 e-mails with you cares about this issue. From a customer service perspective, have a plan in place to identify high-risk relationships and interactions. Know when to escalate: In each of those messages, I requested to speak with a manager. My requests were ignored, and no manager contacted me. Perhaps this was the most disheartening part of the experience. Customers want to know you care, and even if a manager isn’t able to solve the problem, it’s good to know that a customer service leader values your relationship enough to check in. Have a strategy in place that identifies when to escalate a call, even if you ultimately can’t give the customer a refund or other resolution he or she might want. Ultimately, the situation wasn’t resolved and ended with me vowing to never do business with the company again. The whole issue could have been avoided; as a customer, I didn’t need it to give me exactly what I wanted. Information on how to get the tickets, a refund, an exchange, or even just a manager callback would have been enough to save the relationship—as I have done business with this company frequently and often. It wasn’t a product issue or a sales issue. It was a customer service failure. Don’t let the same thing happen to your business. You know how important social media is. However, it can be difficult to know where you have gone wrong. Perhaps it’s time to look at a few other companies like Zappos, National Geographic, and more to see what they have done right. Today’s fast pace of innovation in the field of artificial intelligence (AI) is staggering. For marketers, AI is creating potential opportunities to consider for the long-term marketing mix. These advancements help us as marketers by providing better personalization, automating core services, and even expanding our vision of how key content is created. Marketers need the right tools to do their jobs well. So we’ve prepared a kit just for you, perfect for this time of the year. Whether you’re strategic planning, budgeting, calculating the ROI of your current marketing spend, or evaluating marketing technology, these ready-to-use resources will help you stay ahead in 2018. The holidays are the most profitable time of the year for businesses across industries, and if you’re like most business owners and marketers, you’re amping up your marketing and outreach to garner as much market share as you can. Everyone in your industry having that same goal, however, can lead to significant competition. 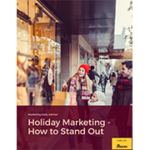 What steps can you take this holiday season to stand out? To thrive, an organization needs a well-trained salesforce in several areas that apply directly to salespeople. These training areas include orientation, specific skills, management practices, travel expenses, safety issues on the road, and even wellness issues that may be specific to salespeople. In this special report, we give you several best practices for these topics, plus a few case studies of successful companies and their sales training operations.